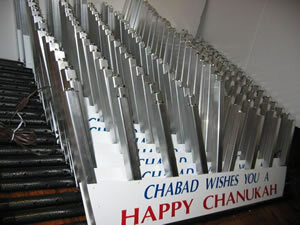 "Chabad wishes you a..." "Lubavitch wishes you a..." "Happy Chanukah"
Check out before you check out! Our new accessories page contains additional items and prices. Please remember to specify whether you would like the sign to say "Chabad wishes you a Happy Chanukah", "Happy Chanukah" or "Lubavitch wishes you a Happy Chanukah." 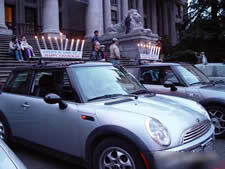 Or, if you are ordering three or more Menorahs, and you would like to customize the signs on your Menorahs, please send us the exact spelling by e-mail or fax. This option is only open to those ordering three or more.